CATALINA ISLAND, Calif. -- Three people died and four others were hospitalized after a boat capsized off the Catalina Island coast Saturday morning. Authorities received a call around 9:32 a.m. on reports of a capsized boat with people in the water. According to the U.S. Coast Guard, several agencies and a Good Samaritan rescued four people. 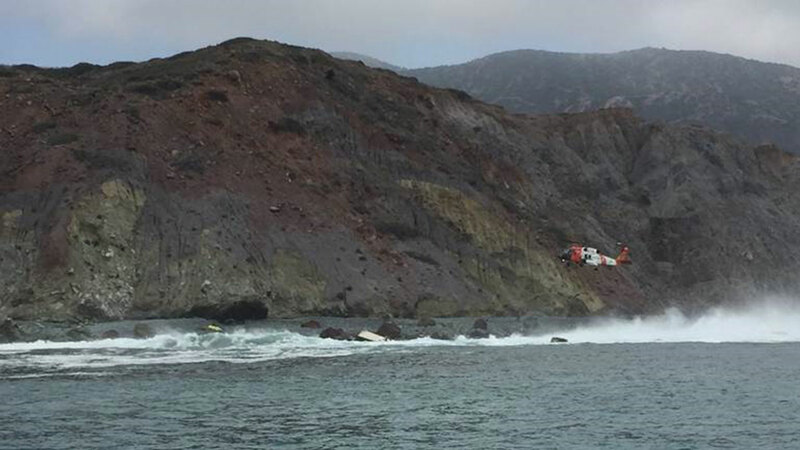 Coast Guard watchstanders received a call from a vessel called Pacific Quest, reporting that a 15-foot skiff with seven people on board had overturned near Salta Verde Point on the backside of Catalina. The boater recovered four of the seven people out of the water and two were unresponsive, the Coast Guard said. Another crew rescued another person from the rocks and took them to Long Beach Memorial Hospital in an unknown condition. Another officer located another person on the beach. The Coast Guard then launched a 45-foot patrol boat, a helicopter and received help from multiple agencies to search for any other victims. The skiff overturned after being hit by two waves, according to the Los Angeles County Fire Department. The waves were reported to be between 4 and and 6 feet along the island's coast, the Coast Guard said. The ages and genders of the victims were not released.